The shuffling and infighting in the Chinese Communist Party’s (CCP’s) top leadership circle is heating up further as the 18th National Congress approaches, and members are vying for a seat in the Politburo Standing Committee (PSC), the nine-member body that governs the country. But it looks like the elite group at the top of the Party’s hierarchy may be reduced to only seven, making for an interesting new political landscape. The ousting of former Chongqing Party chief Bo Xilai has escalated the Party’s power struggle between the two main factions–Hu Jintao and Wen Jiabao leading one side, and former Party head Jiang Zemin and domestic security chief Zhou Yongkang on the other side. Bo Xilai was a candidate for the PSC, chosen by Jiang to replace outgoing Zhou Yongkang at the Party’s 18th National Congress this fall. But this has now changed. Chinese media are making lists and speculating who will become the next generation of PSC members. The South China Morning Post recently said that many people believe the removal of Bo has strengthened the power base of Party leader Hu Jintao and premier Wen Jiabao, and it is likely that their trusted allies will make the new list. Actually, prior to the 16th Party Congress, the PSC had been a seven-member committee. It was former Party leader Jiang Zemin who added two extra members. According to Chinese dissident Song Yuxuan, who lives outside China, Jiang pushed the appointments of Li Changchun and Luo Gan, as those two men would continue Jiang’s persecution of Falun Gong and support Jiang, Song told The Epoch Times. Li Changchun, as the head of the Central Propaganda Department, has played an important role in controlling media and guiding public opinion in China. “If not for Li Changchun’s roles [as both Propaganda Minister and PSC member], Hu would have been able to directly arrange the Central Propaganda Department to influence public opinion himself,” Song said. Zhou Yongkang and Luo Gan, the current and former heads of the country’s domestic security apparatus–the powerful Political Legislative Affairs Committee–are Jiang’s dedicated allies and have remained the main force behind the persecution of Falun Gong and of dissidents. In addition Zhou is still a member of the PSC. 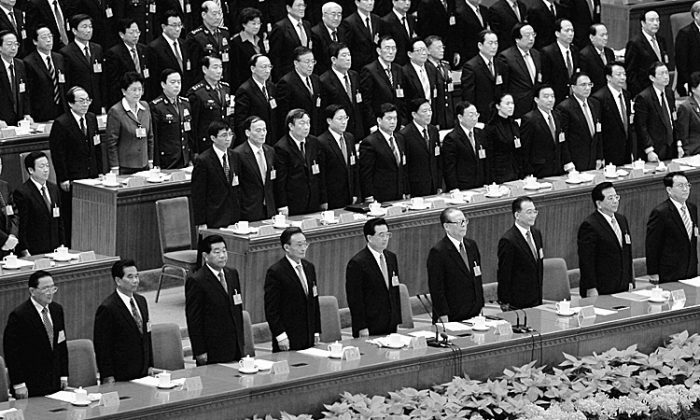 In the past 10 years, the power of the PLAC has expanded rapidly and enormously, controlling Public Security, the courts and the Procuratorate, the Armed Police, as well as judiciary organs such as forced labor camps, and has therefore become a second power center, that has been threatening and weakening the power of Hu Jintao. Song predicts that during the upcoming 18th Party Congress, Hu may announce the removal of two PSC members. “After years of suppression by the Jiang faction, the reduction would help Hu to remove their influence within the Party completely,” he said. Click www.ept.ms/ccp-crisis to read about the most recent developments in the ongoing power struggle within the Chinese communist regime. In this special topic, we provide readers with the necessary context to understand the situation. Get the RSS feed. Get the Timeline of Events. Who are the Major Players? Song said when Hu Jintao came to power, except for Wen Jiabao, the rest of the seven PSC members all had close ties to Jiang Zemin. After stepping down from his post as general secretary of the CCP, Jiang still remained as the head of the Central Military Commission. “Among the current generation PSC members, only Vice Premier Li Keqiang belongs to Hu’s Youth League faction. Hu therefore has been isolated and impotent in the Party,” Song said. Among the new PSC candidates most often mentioned besides Xi Jinping and Li Keqiang, who are respectively the presumptive next head of the CCP and the next premier, are Wang Qishan (like Li Keqiang a Vice Premier), Wang Yang (Party Secretary of Guangdong Province), Li Yuanchao (a member of the 25-member Politburo Committee and the head of its Organization Department), Hu Chunhua (Party Secretary of Inner Mongolia), and Liu Yandong (also a member of the Politburo Committee who holds the post of State Councilor), who may possibly become the first female member of the PSC. Song said if the PSC is to be restored to a seven-member organization, except for Xi Jinping, the most discussed members are all part of the Youth League faction headed by Hu Jintao, and Hu will have the opportunity to completely remove Jiang’s faction from the top CCP ruling committee. Liu Yinquan, a former professor in history at Shandong University and now secretary of the China Social Democratic Party, which is based outside China, agrees. Liu thinks that those remaining on the PSC loyal to Jiang will be removed if the reduction is made. Recently many members of Jiang’s faction, who serve as regional officials as well as in the military, have pledged their loyalty to Hu. Jiang Zemin hasn’t been heard from in several months and is said to be in a vegetative state.